Pulitzer Prize-winning author and journalist Lawrence Wright chronicles that trip in "Camp David," a new play about the secret 13-day negotiations at the famed presidential retreat that ultimately resulted in a historic peace agreement between long-time adversaries Israel and Egypt. The 100-minute stage production directed by Molly Smith focuses on the efforts of President Jimmy Carter (played by Richard Thomas, star of "The Waltons") to referee, cajole, arm-twist, threaten, and, on more than one occasion, pray his way to a peace deal between Israeli Prime Minister Menachem Begin and Egyptian President Anwar Sadat. The odds were not in his favor. At that time in September 1978, the two nations had been in a state of war for 30 years. There had never been a peace treaty between Israel and an Arab nation. Both Begin and Sadat had strong personalities, long political agendas, and a lot to lose. What could possibly go wrong? In the play, tempers flare, centuries old wounds are re-opened and at various times the Middle Eastern leaders threaten to end the talks and return home. At first, Thomas' Carter tries to handle the conflict with the soft touch of a Southern minister counseling a bickering married couple. He patiently drives back and forth between Sadat's and Begin's cabins in a show of golf cart diplomacy. But as he realizes the depths of the two men's distrust of one another, he starts to doubt whether a deal is possible and eventually question his own faith. "It's falling apart. Do you care?" he says in one anguished prayer. "God? Where the hell are you?" Religion is a major theme in "Camp David." It's at the root of the conflict and one of the key motivating factors for each character. Wright describes the play as "three men representing three religions" who meet "in order to solve a dispute that religion itself had largely caused." But it's the tension between Begin and Sadat, two big personalities played convincingly by Tony Award winner Ron Rifkin and Egyptian film actor Khaled Nabawy, that drives the story and gives it its emotional impact. Carter has his re-election on the line; for Begin and Sadat, the stakes are much higher. At one point, Sadat says, "I am willing to pay any price to bring peace, Jimmy, but I don't want to die for half-measures." The statement is all the more poignant knowing that Sadat would be assassinated just three years later in large part for what he helped set into motion at Camp David. Wright originally conceived of "Camp David" to have only three speaking roles: President Carter, Sadat, and Begin. Over time, he realized he was missing an important dramatic element, and that was first lady Rosalynn Carter, played by Hallie Foote. Mrs. Carter, who first suggested to her husband to invite Begin and Sadat to the secluded mountain retreat, has the fewest lines, but appears at key moments in the story. "Rosalynn served a purpose, which was to make peace among the peacemakers," Wright told theater-goers after one recent performance. In one scene, the president quickly loses control as Begin and Sadat hurl insults and accusations at each other. As they're about to storm off, Rosalynn enters with a tray of tea and cakes and asks, "Well, how is the peace-making coming along?" She dispenses tea and layered Southern wisdom meant to both charm the two men as well as remind them of their larger purpose. "I'll let the peacemakers get back to peace-making," she says as she exits. "That's what you're here for, isn't it?" The play is meticulously researched. Wright drew from the private diaries of both the former president and Mrs. Carter, as well as interviews with members of the Egyptian and Israeli delegations. He amassed so much information, he is now writing a book about the summit based on research he had conducted for the play. Watching "Camp David" through a modern lens provides unique context to historical events. Carter, Begin and Sadat argued over the term "occupied territories," a debate that still rages today, as evidenced last month when New Jersey Gov. Chris Christie apologized for using the term in a speech to Jewish Republicans. And the ongoing unrest in modern Egypt hangs over the stage like a dark cloud. Both funny and powerful, "Camp David" shows what drama lies on the rocky, winding path to peace. 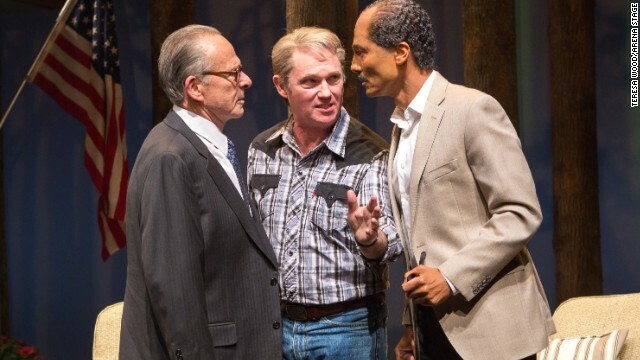 "Camp David" runs through May 4th at the Arena Stage in Washington, D.C. There is no doubt the safety is off and the fingers are on the triggers still today .The U.S. has armed half the middle east . So be it let it fly . I love it. "John Biy" is playing Jimmy Carter. Perfect casting. It hasn't gotten any better, since then.